I love music. I have so many favorite artists that it would take a month to highlight them all, and my “five-star songs” list in iTunes can play for days without a repeat. There is one artist that eclipses them all: Garbage. I have never been able to explain it. Garbage flies in the face of a lot of my specific musical preferences. They don’t have the best lyrics. They are not the most creative songwriters. Shirley Manson is not always a technically strong singer. They often let sophisticated production obscure the human performances that make a song. I don’t care. I never have. There is something about their formula – Shirley Manson plus Butch Vig, Duke Erikson, and Steve Marker – that forms the most compelling possible music for me. That means it is a very, very big deal when they debut their first single after a nearly seven-year hiatus, interrupted by the release of just a few scant b-sides. There are many familiar facets about this song. The throbbing, undifferentiated layers of guitars and drums topped with a crisp, chiming electric. The obnoxiously fuzzy riff that at once underpins and interrupts the phrases. Shirley’s sultry, half-spoken unspooling of lyrics. An unusual bridge that interrupts and deconstructs the song, yet perfectly returns us to exactly the point where it began. Then there is the chorus. Layered vocals as far as the ear can hear, and army of Shirley Manson in perfect, major-key harmony, obscuring all but the most rudimentary rhythms beneath her. Do the detraction mean I’ve stopped pounding this track on repeat for the past week? No. Even the worst Garbage song (which this is nowhere near) is still a song that infects my brain in a neuron-by-neuron guerrilla campaign. Will this be the sound of Not Your Kind of People? Probably not. No single Garbage song ever communicates the full arsenal of its album – especially not the lead single. Was the dark, surging, vengeful “Vow” the most representative track of Garbage? Was the pastiche of riffs and whispered howl of “Push It” a better sample of Version 2.0 than “I Think I’m Paranoid” or “Special”? Did the gender-bending stomp of “Androgyny” adequately explain the sour pop spectacular of Beautiful Garbage? And, did the Sabbath-esque riff and sparse verses of “Why Do You Love Me” explain the stripped down, real-band sound of Bleed Like Me? I guess that’s just one more way that Garbage stands apart from all of the other bands I love. While I struggle to dissect and define their music, with Garbage all that is an afterthought. I have an inherent trust of Garbage that no other artist I love can engender. I can’t help but dissect their songs, but for once it is beside the point. It’s not why I’m listening. I’m listening because, over fifteen years after I first listen to the full length of their debut, they are still my favorite band on the planet. 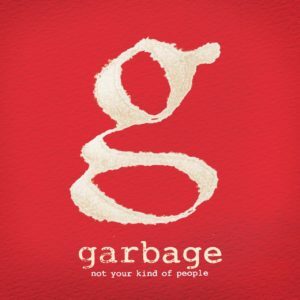 Not Your Kind of People is out on May 15 in standard and deluxe versions (deluxe includes extra songs, and Garbage are known for the awesomeness of their B-Sides). I made you a mixtape! A few weeks ago I received an email out of the blue from one of my favorite indie songwriters, the fantastic and frequently award-winning Mieka Pauley. Many moons ago I had volunteered our (former) house for a private show, and Mieka was finally ready to redeem our invite. Such was the genesis of our impending house concert on 8/22, with Mieka Pauley and a special performance by yours truly, because this little shindig is AKA The Crushing Krisis 10th Anniversary Concert. Mieka’s been on my mind all week, as is every one of Filmstar’s 17 songs as I try to absorb them all into my bass-playing body. Thus was the genesis of this mixtape. You can download all seven songs as a 38MB zip for a limited time. This was the free advance track from her outstanding 2007 LP Elijah Drop Your Gun. It’s an outstanding song, and probably the reason I chipped in towards her fan-funded album. Despite it’s simple bass line, this song is the one that’s vexing me the most in rehearsal. Not coincidentally, it’s my favorite of all of their pre-2010 tunes. Watch it live on YouTube. Download the entire mixtape for a limited time. My best and most-interesting tweets of the last week (including extensive skydiving coverage). Read my tweets they happen by following me on Twitter. The article caught my interest because it’s about lifelong, subjective, sometimes irrational grudges that people develop against artists. Many of the Onion’s regular contributors shared their personal grudge matches, from Sofia Coppola to U2. Surely you’ve done it. A movie star whose weird mouth-shape you just can’t get past? A musician whose utterly terrible new album forces you to lose faith? The reason doesn’t matter so much. just that they’ve jumped your personal shark permanently, never to return to your good graces. A few spring to my mind immediately. Alanis Morissette – by her fourth US record she had entirely quit writing catchy, interesting music, so I gave up. Chuck Palahniuk – wrote too many overly-convenient, repetitive books for me to care that he might eventually get better. Jason Mraz – I found his songwriting schtick underhwhelming from the first second I heard him. The grudge article is an interesting counterpoint to something else that has been on my mind lately: permanent “must-buy” policies. Lifetime subscriptions, let’s call them. Surely you have these too – an unflinching desire to consume everything by a specific artist. I’ll buy any song by Garbage, watch any movie by David Fincher, and love any print by Mucha, no questions asked. It’s a form of brand-loyalty – these artists appeal to some aspect of your personal aesthetic, and you’ll support them forever for it. Who is your #1 Grudge, and why? What about your most major undying, devoted subscription? Could the grudge ever (re)earn your trust? Could the subscription ever fall from the pedestal? Earlier tonight in the back of a taxi I realized that Garbage’s “Bleed Like Me” is cribbed pretty directly from “Walk On the Wild Side” by Lou Reed.